Basically, I sleep very well. When I was in my early 20s I was borderline narcoleptic - it was actually problematic in university because I would be sitting in seminars and just fall over asleep. I've missed my stop on buses, woken up on park benches, easily done many overnight trips (planes, trains, boats, buses) in my travels. Then, out of the blue 3 years ago, light kept me awake. I'd wake up at 5am with the sun; a full moon would mean no sleep. It was driving me crazy. Around that time, I went away for the weekend with my friend, who has had all sorts of insomnia issues. We shared a hotel room and she had a sleep mask. I'd never even thought of such a thing! So, I got home and tried one myself. Every one that I tried really bothered my skin, or didn't really keep out the light, or was just uncomfortable to sleep with. Then! 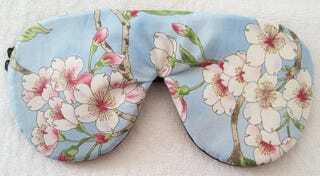 I stumbled across this etsy shop - the All Natural Sleep Shop and I have two sleep masks from there now. One is a lightweight cotton one, which stays in my little suitcase that is always 90% stocked because I often travel for business at short notice. The other is a 'luxury' one, made of many layers. Both are nice on my skin and block out light very, very well. They have adjustable backs and light elastic that doesn't dig in or pinch. Considering these are not made in a factory in China with minuscule labour wages, and are made of premium fabric, the prices aren't unreasonable, and the amount of quality sleep I've had thanks to these is worth it. So worth it, in fact, that I have two more on order!